The Road to the Kentucky Derby is heating up this week with not one, not two, but THREE Derby prep races on Saturday. The Withers Stakes will be contested at Aqueduct, the Holy Bull will be run at Gulfstream Park, and The Robert B. Lewis Stakes will take shape at Santa Anita. For each race, I’ll identify some possible daily double bets either leading into, or coming out of the Derby prep races. Of the three Derby prep races this weekend, I feel the most visually impressive winner we may see this Saturday (of the the Derby prep races) will be #3 MORRETI (3-1 morning line). That is a pretty bold statement, I must admit, due to a big favorite in the Gulfstream Park race and two major contenders in the Bob Lewis. Moretti won at this distance last out to break his maiden on this track on December 20 as an odds-on favorite. While he beat a questionable cast of characters and didn’t look so professional down the stretch, trainer Todd Pletcher is making an equipment change that I feel this horse needs–adding blinkers. Now I can see that Pletcher adding blinkers isn’t great for the ROI in the long run, but in this instance, I truly believe Moretti will straighten out, becoming a more focused horse, and show the Pletcher barn, the fans at Aqueduct, and us horseplayers that the Medaglia d’Oro colt is worth his $900,000 Fasig-Tipton August price tag. Race favorite #1 Tax drew the rail, garnered a high Beyer figure finishing third in the Remsen, and will be glad to see Maximus Mischief run in Florida on Saturday. But this one is staring the dreaded “bounce” square in the face. The #6 horse Our Braintrust is the only other logical contender in the Withers–but I’m going with Moretti. Race 8 at Aqueduct has a field of eleven New York breds four years old and up running in a non-winners of one optional claiming race for a $25,000 tag. Of those runners, I think it’s a two-horse race between #4 HOROSCOPE (5-1) who should be near the early lead and #9 PAPA SHOT (7/2) who should be closing from off the pace. The big favorite in this race will be #8 Maximus Mischief, who was last seen winning the Grade 2 Remsen at Aqueduct last December. He’s making his Florida debut after running twice at Parx last fall before winning the Remsen. Call me old fashioned but horses don’t always take the New York to Florida trip so well, and this one will be a prohibitive favorite. In a situation like this, I tend to disregard the big chalk for betting purposes, but still figure the horse into my projected pace scenarios. In this case, we should be looking at a pretty brisk pace with the outside horses (#9 Gladiator King and #10 Going for Gold) gunning to the lead, prompting Maximum Mischief (to their immediate left) to either a.) take them head-on for the early pace, or b.) do something he’s yet to do in his young career–rate off the pace. Whether Maximus Mischief fends off the #9 and #10 or follows those leaders closely, he’s forced to expend a lot of energy early. While he is cutting back from 1-⅛ in the Remsen to 1-1/16 here, it must be noted that the Aqueduct track he raced on in December favored speed on that date. The horse that I think has the next-best chance to win the race, and the one I’ll use in my double is #6 MIHOS (5/2). This Cairo Prince colt was a $320,000 Keeneland September purchase that actually DID take the New York to Florida switch well, and is primed to improve off his solid effort winning the Much Macho Man Stakes here at Gulfstream going a mile. The added half furlong will be of no consequence. Mihos should be able to sit well off the blistering early pace and could very well be picking off tiring front-runners deep in the stretch. Don’t be sad for sire Into Mischief for too long if his son Maximus Mischief doesn’t win the Holy Bull. Another one of his sons is set to win on debut in the finale at Gulfstream on Saturday. #1 HONEST MISCHIEF is a first-time starter for trainer Chad Brown, and this colt’s mother is the dam of three stakes winning offspring. This one has been lights-out on the work tab, and there’s no secret he’s going to be the big favorite in the $50,000 maiden special weight finale on Saturday. While neither Mihos nor Honest Mischief will go off at juicy win odds, playing them together in a double will pay handsomely, since the big favorite Maximus Mischief could have a very disappointing (to some) finish. 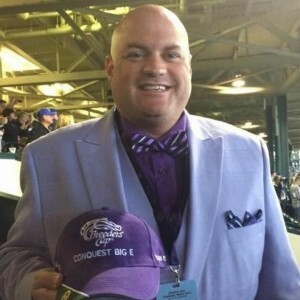 For a race with only six runners, the Robert B. Lewis will feature three major West Coast contenders and should be an exciting race, especially if all three are in contention down the stretch. #4 Gunmetal Gray won the Sham Stakes here at Santa Anita on January 5th by sitting a stalking trip and beating not exactly the best three year olds California has to offer. He looked impressive, but that race isn’t exactly one to brag about. #6 Nolo Contesto won at Santa Anita last out, breaking his maiden in his second career start. He won at a mile, improving off hi debut two furlongs shorter by garnering an 80 Beyer figure after recording a 66 in his debut. Another forward move has him on par with Gunmetal Gray and the horse I will be backing in this Grade 3 tilt–#5 MUCHO GUSTO (8/5). Mucho Gusto, the son of Breeders’ Cup Classic winner Mucho Macho Man was a winner on debut at Los Alamitos, then followed that up with a victory in the Grade 3 Bob Hope at Del Mar in November last year. He was last seen finishing second to major Kentucky Derby contender Improbable in the Grade 1 Los Alamitos Futurity last December. Trained by Bob Baffert, Mucho Gusto retains the services of jockey Joe Talamo, and a forward move of his Grade 1 effort last out is more likely to happen than not. This is your Robert B. Lewis winner. Race 7 at Santa Anita is 5-½ furlong sprint on the dirt for three year old $30,000 maiden claimers. Four of the ten runners are making their debut. We will play half the field in the double, and the horses I’ve tabbed for this race are #2 CAMZUL (4-1), #3 CALDER VALE (6-1), #5 Toby Time (5-1), #8 ROYAL ASPIRATIONS (6-1), and #9 R B EYE (7/2).